One of the most interesting stories in the rich history of the state of Delaware is the internal struggle the state faced as a slave state that also had a large free black population during the mid-1800’s. 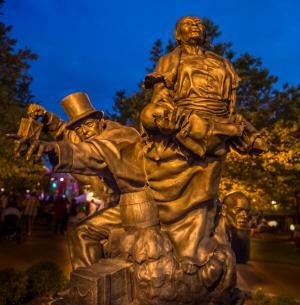 This situation led local activists to risk their lives and their freedom to participate in helping slaves escape through Delaware and onto Pennsylvania via the Underground Railroad. 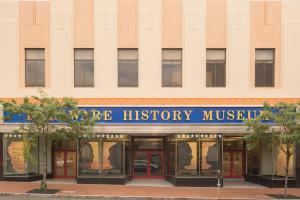 Today, visitors to the Greater Wilmington, Delaware area can explore several different historic landmarks and museums that are dedicated to preserving the history of those who were willing to risk everything to do what they believed to be right. If you are planning a weekend in or around Wilmington and would like to learn more about the history of Delaware’s Underground Railroad, these are few of the places along the Harriet Tubman Underground Railroad Byway to stop and learn more about this remarkable story. Located at Market Street along the Christina River, this park was named in honor of the legendary Harriet Tubman, as well as Delaware Underground Railroad stationmaster Thomas Garrett and is a designated Network to Freedom site. The park is positioned near the bridge that led many escaped slaves into Wilmington, and is also located close to the former site of Garrett’s home on Shipley Street. And although Garrett’s home no longer stands, you will find a historical marker in its place and it too is designated an official Network to Freedom site. Visitors to the park today will find a mile-long scenic walkway that is lined with interpretive panels that describe the history of the Underground Railroad in Delaware, and the park serves as a place for celebration and festivals on Wilmington’s Riverfront. Popular events include the Bob Marley Festival, Riverfront Blues Festival and August Quarterly among others. Another local destination that is dedicated to preserving the history of the Delaware Underground Railroad is the Delaware History Museum, which houses the Jane and Littleton Mitchell Center for African American Heritage. Here you will find letters and artifacts that offer deep insight into what life was like for many different people involved with keeping the Underground Railroad going. 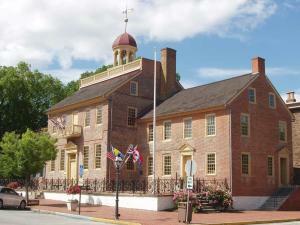 Attached directly to the Delaware History Museum is Wilmington’s Old Town Hall. Here you will find the site of the former city jail which once held captured freedom seekers, and ironically, was also once a meeting place for abolitionist. One of the most significant stories of the Underground Railroad in Delaware can be found at the New Castle Court House Museum in Old New Castle. Here you will find an exhibit dedicated to telling the story of Emeline Hawkins and her family as they daringly escaped slavery in 1845. The Courthouse Museum, site of the 1848 abolitionist trials, also features exhibits on Thomas Garrett, John Hunn, and Samuel Burris. 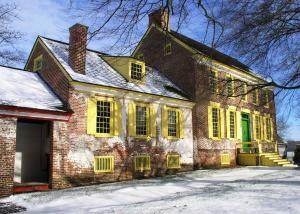 This historic German designed home from the 1770’s in Odessa, Delaware, about 30 minutes south of Wilmington, was one of the many hiding places for runaway slaves along the Underground Railroad in the First State. Here you can learn the story of Sam a fugitive slave, who was hidden by Mary Corbit inside a small attic crawlspace while local authorities searched the house for him in 1845. The Corbit-Sharp house is a designated Network to Freedom site. Moving a bit south into Dover, the Old State House Museum is another wealth of information about the history of the Underground Railroad in Delaware. Here you will learn the story of Samuel Burris, who was an Underground Railroad conductor that was captured and convicted before being purchased by abolitionist friends who helped him escape the state. While in Dover, you will also want to stop at the John Dickinson Plantation, which was home to more than 60 slaves at the height of slavery in the United States. Dickinson was one of the founding fathers of the United States and one of the signers of the U.S. Constitution, and his home would later be known as one of the best examples of slaves expressing their discontent through attempts at escaping. These are just a sampling of the sites located along Delaware’s Harriet Tubman Underground Railroad Byway. The full byway stretches from the Maryland-Delaware boarder through Kent County, Delaware and continues north passing through Smyrna, Middletown and Odessa then follows Route 9 along the Delaware River to New Castle and Wilmington and eventually to the Delaware-Pennsylvania state line. No matter how much you know about the history of slavery in Delaware, there is a tremendous amount to be learned from the people who struggled through one of the most difficult times in our country’s history. These historical landmarks and museums offer tremendous insight into the people who guided us through those periods, which makes for an interesting learning experience.